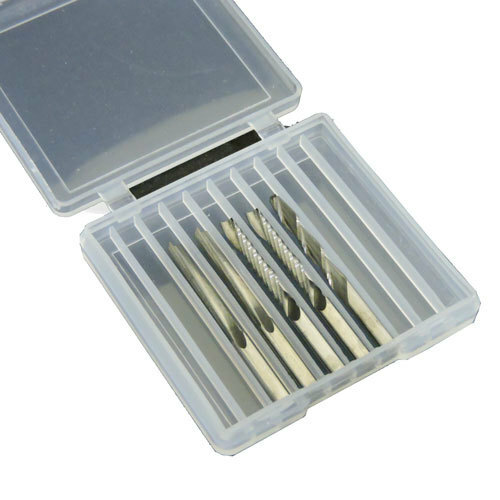 Milling Bits Starter Pack One Ideal for starting with your DIY CNC experience, this set contains following milling bits. All bits are 1/8 inch shank diameter. Click on the names to get more details. a. Solid Carbide 2 Flute (Straight) End Mill - 02 pcs. CED - 3.175mm, CEL - 22mm, OAL - 40mm. b. Solid Carbide Single Flute (Upcut) End Mill - 02 pcs. CED - 3.175mm, CEL - 22mm, OAL - 38mm. c. Ball End Mill - 01 pc. CED - 3.175mm, CEL - 17mm, OAL - 30mm. d. One Case - White Colour.